As a statement ingredient in laddoo with just three ingredients rolled together: dates, orange peel candy and almond powder. - Enough raw cane sugar to smother it. 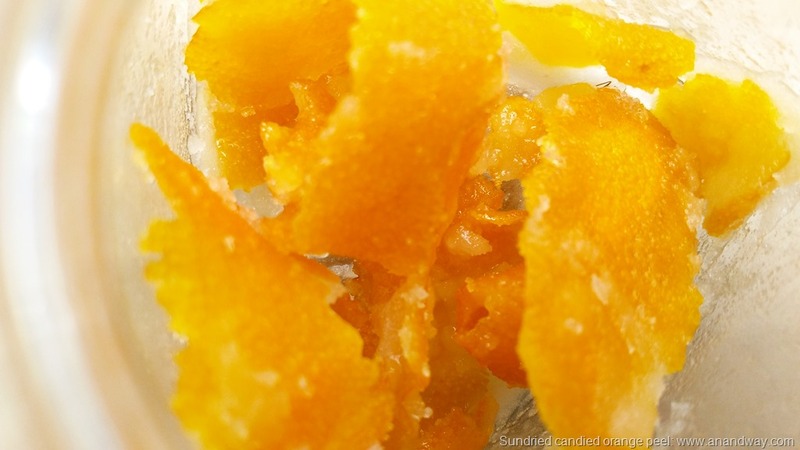 In a glass jar, layer the sugar and orange peels. Close the lid and give it a nice shake, so that the sugar coats the peels well. Open the lid and cover it with a cotton muslin cloth (like a handkerchief), so that water can evaporate. Stand the glass jar in a bowl of water to prevent ants from getting to the sugar. Keep it on a sunny windowsill. Once a day, shake up the ingredients so that the sugar gets distributed evenly as it melts and gets absorbed into the peels. I use a fork to shake it. 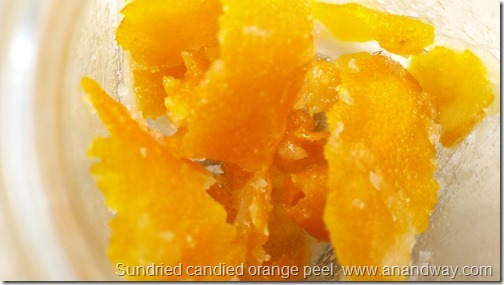 When the peel looks all glassy and candied, close the lid tightly and keep it in your kitchen for use in instant recipes. It keeps well forever even at room temperature.